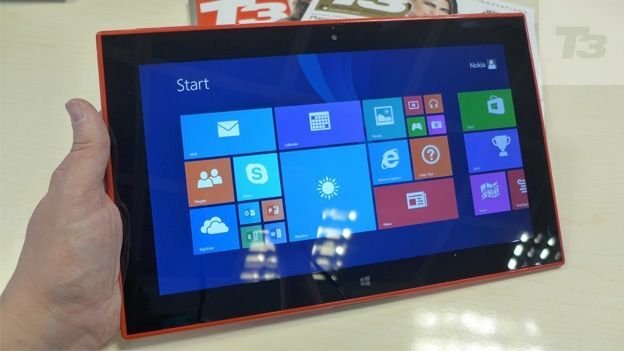 Is the Nokia Lumia 2520 tablet good enough to challenge the iPad Air? If you want a tablet computer - and as you may have heard, they're all the rage - you first need to decide what you want. The elegance of the iPad Air? The bargain price and decent specs of the Tesco Hudl? The PC-replacement solidity of the Microsoft Surface 2? Finally, there's a tablet that does all of the above and makes a compelling alternative. The Nokia Lumia 2520 is instantly recognisable as a Lumia, thanks to the familiar colours and polycarbonate casing found on the likes of the Nokia Lumia 1020 and Nokia Lumia 925. It's solid, smooth and appealingly warm to the touch. Plastic is a difficult material to use and make classy. Nobody does it like Nokia, though Apple's iPhone 5c is another successful example. The Lumia tablet may prove to be the high point of design from Marko Artishaari for Nokia - he has said he wonít be joining Microsoft when the companies merge - and is unmistakable. Glossy or matte finish depending on colour choice, the edges are curved so that it feels more portable and certainly makes it fit pleasantly in the hand. This tablet is noticeably lighter than last year's iPad 4, even though Nokia's screen is bigger, though no match for the new iPad Air. For completists, the weights are Lumia 2520, 615g; fourth generation iPad, 662g; iPad Air, 478g - all weights quoted are cellular tablets, not wi-fi only. Nokia, being a phone company hasn't made a wi-fi only version of the 2520. No surprise. The Nokia tablet's dimensions compare well to the iPad 2 - at 267 x 168 x 8.9 mm it's narrower and thinner from front to back, though the iPad Air's measurements mean the Lumia is longer and less thin, though still narrower by a pinch. The 2520's reasonable weight compared with those inviting rounded edges are designed to make you want to take it with you as you go, not just use it as a second screen to distract you while you watch TV. It certainly feels light enough to use on the go, even if extended one-handed use may tire you. Nokia's palette of colours is unmistakable. The tablet is available in two matte colours (blue, black) and two gloss finishes (white and eye-searingly bright red). All look great, though the glossy version is something of a fingerprint magnet. This is a Windows 8.1 tablet, and the tile interface so familiar from Windows Phone looks great on this display. Note that this machine uses Windows RT, not the full version of PC OS. As you'll know, this means that you can't sideload any old Windows program, only ones found in the Windows Store. This is a new app store, so has some way to go yet. More apps arrive all the time, but there are still some big names missing and plenty of programs available for the full Windows version that are not in the app store so frustratingly absent here. It emphasises that a tablet isn't the same as a PC, and in testing the 2520 we rarely found there was much we needed that wasn't there. After all, the full Microsoft Office suite is on board, easily accessible from the Start screen of dynamic tiles. And there are plenty of Nokia speciality apps such as the excellent Nokia Music, a free music station that works straight out of the box, the snazzy Nokia Camera with its range of filters and special effects, not to mention HERE Maps, which lets you download free maps over wi-fi before you travel so you can access them abroad without the need for crippling data roaming charges. The maps aren't as whizzy as Apple's or as comprehensive as Google's, but work tremendously. All of which means the 2520 feels like a consumer device, not a professional one - just as the iPad does, though there is a keyboard attachment available to make text input easier. The 10.1-inch display here is a real joy. Like the Microsoft Surface and Surface Pro screens, this is Full HD resolution, so the pixel density is slightly higher than on Microsoft's own-branders because this is a little smaller (10.1ins against the Surface 10.6in displays). It looks great, not least because alongside excellent resolution of 218ppi it has Nokia's Clear Black Display technology which makes the screen more easily readable in bright light like, you know, outside than rival screens. It's also a very bright screen, clocking in at 650 nits, which is a measurement of brightness, not pesky hair lice. It means the screen really shines, and video playback is really standout. Movies look super sharp, with a rich colour palette and wide viewing angles. Tablets are not great cameras ergonomically and there's no getting away from that. The shape that evolved for dedicated snappers is better, but tablets have the convenience of slim profiles and the connectivity that most cameras can't match. Still, Nokia's 6.7MP camera sensor is better than most and works with the camera apps on board with others ready to be downloaded. Most recent of this increasing range of Nokia specialities is Nokia Refocus which takes multiple shots at different focus points so you can choose which parts should be sharp after youíve taken them, a bit like the Lytro Light Field Camera. There's also Nokia Storyteller, which is a novel way to arrange your photos and videos. Zoom out on a photo and the software pulls back to reveal a map, showing where the picture was snapped. It's very cool. There's a front-facing 1.2MP camera and the tablet shoots video, too. It's a 1080P recording resolution on the rear camera, 720P on the front one. Video looks sharp, even in lower light conditions. The Lumia 2520 is a real performer. The Qualcomm Snapdragon 800 chip, a quad-core 2.2GHz processor, powers everything along happily. It runs as a Nokia Lumia smartphone does, that is, smoothly and at speed. The decent amount of RAM, 2GB helps to keep things nippy. It certainly makes the Windows RT 8.1 OS look slick and speedy, and keeps the touchscreen responsive and enjoyable to use. Ití's also fast enough to make apps open quickly and web pages build in an instant, connection speed permitting. Tablets have big batteries (well, there's room) so most promise and deliver decent life between charges. Many offer 10 hours of use but the 2520, as they say in This is Spinal Tap, goes to 11. It certainly seems to deliver on its promise, too, so you can feel relaxed that it's not going to quit on you mid-way through a movie, say. Having 4G connectivity can drain a battery, but in our tests the 2520 kept on going. There's no expandable memory on this machine, which is always a shame, and there's only one storage capacity. Still, as this is 32GB there's a usable amount, even after the substantial bite taken by the operating software. This is one of the best tablets yet built, thanks to Nokia's swish and tactile design that fits the hand splendidly, a size that is conducive to on-the-move usage and an elegant implementation of the Windows RT 8.1 OS. Sure, the RT bit means you can't put just any old program on it, and the Windows Store needs to fill some of its bigger gaps, but this is a highly capable, versatile device. Nokia's skills extend beyond gorgeous hardware thanks to its innovative and accomplished speciality apps. Expandable storage would have been good, and the tablet's weight is a little too high. Last year it would have been cutting-edge but the arrival of the iPad Air has rewritten the rules a little. Beyond that, though, it's mostly good news and is easily the slickest Windows tablet around.